In the afternoon we reach the National Park of Puyehue which abounds in hot springs. Recreational time for passengers in the springs ( at their own expense ) or just time for going on a hike to the paths of this park During the afternoon at the appointed time we return to Puerto Varas or Puerto Montt. Approx time two and a half hour. 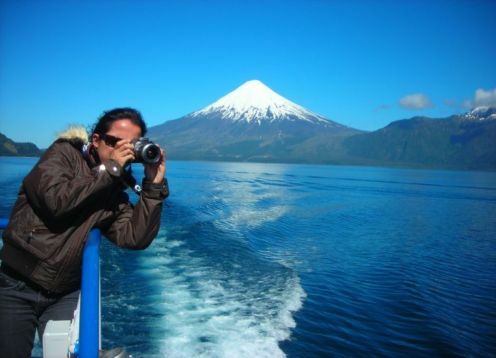 Daily tours from Puerto Montt or Puerto Varas across the route 225 that joins Puerto Varas with Ensenada and Petrohué , we will see the main attractions that gain the interest of nature´s lovers, wonderful places like Pescado river, small community in the edge of the LLanquihue lake. We will visit the waterwheel, el Condor a place that will give us the chance to admire a 46 years old living specimen of this bird and visit the Puerto Humos, a special place where the delicious smoked salmon fish is prepared.The tourist will have time for shopping and tasting the fish. Arrival at the Ensenada village and we will get The Laguna Verde located on the foothills of the majestic Osorno volcano. Time to walk around and soon afterward we move to a local restaurant called El fogón Pucarà , a place where the stick-roast bovine and pork are prepared. Time for lunch. In the afternoon we will be arriving at Vicente Perez Rosales National Park, to see the world famous Petrohuè falls, and then we finish our excursion in the area of the route 225 that leads us to Todos Los Santos ( all saints) Lake also called Emerald , a little trek is possible here, or you can take some pictures or rent a boat to sail the wonderful deep emerald color lake. 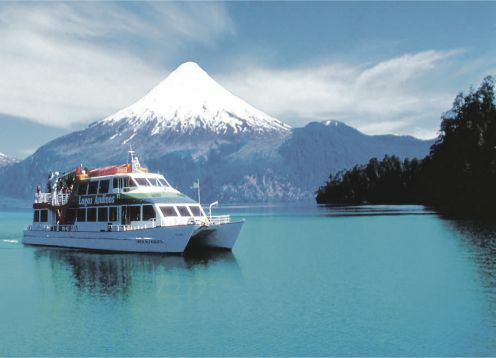 The return trip to Puerto Varas , Puerto Montt or respective hotels takes about 40 to 60 minutes. Visit to Arena Gruesa (thick sand) beach, San Antonio fortress, which is an old Spanish fortress dating back to 18th century, visit to the Interactive and handicraft museum of Ancud, Municipal Market, downtown and Costanera avenue (promenade). The myths, customs, traditions and magical tales of one the biggest islands in south America will be narrated by our guides. Start of the tour leaving the respective hotels in Puerto Varas or Puerto Montt, visiting first the highest point of the city, where we can appreciate a panoramic view of the city of Puerto Montt, visit the monument to the German settlers, and then continue Towards the Balneario de Pelluco, starting from kilometer 0 of the Carretera Austral, we will return by this same route to move towards the sector of Angelmo. We will also visit Angelmo Avenue, famous in our country for its large number of Craft Stores and, of course, the Fishermen s Cove and Municipal Market where we will get to know the daily activity of the seafarers who arrive to this place bringing the traditional seafood and fish, to then be sold in the Market, in this market we will also find the typical kitchens where the richest and traditional typical dishes that characterize our area are sold. Transfer Hotel  Airport or Bus Terminal to Puerto Montt or Puerto Varas.